I've noticed some mx5's (Eunos) tombstones are different. There seems to be one that has a recessed radio hole (so radio sits flush with dash), and others where the radio (single din) sits proud/sticks out from dash (same as my 97 UK MX-5. What models had the recessed version? 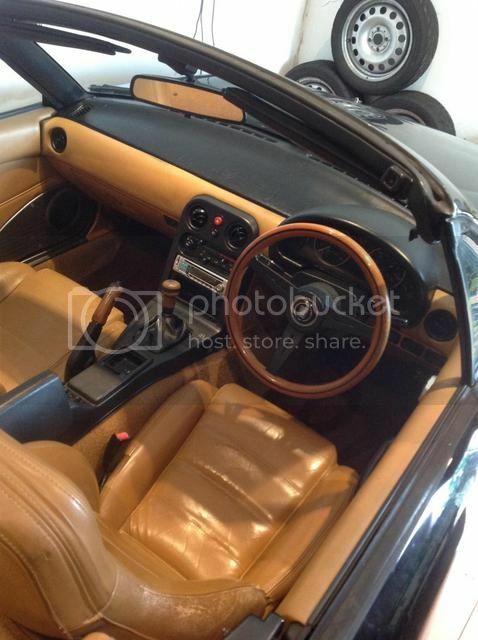 I've seen it on a 97 SR ltd Eunos (see white one for sale on mx5city) Was the the only one that had it? VR's etc don't seem to have it. I'd really like to change mine to the SR recessed one if possible as prefer the radio sitting flush with the dash. Tried finding one on eBay but no luck so far. Saz was first to answer mate. He posted a link to a topic where a guy had made a custom install using a retro radio (looks old, but has DAB, usb etc.) Think I'm going to have a go at something similar! Looks sweet! what you might have seen is two different ways of fitting the head unit - the radio cage can be attached to the tombstone panel or brackets can be fitted to the sides of the radio (no cage) which attaches to the uprights that hold the heater panel in place, so the radio is fixed before you fit the tombstone. or it may have been a us spec (miata) tombstone which is slightly different, the pop up / hazard buttons are in the same place but flush rather than with the oval surround bit. gm wrote: what you might have seen is two different ways of fitting the head unit - the radio cage can be attached to the tombstone panel or brackets can be fitted to the sides of the radio (no cage) which attaches to the uprights that hold the heater panel in place, so the radio is fixed before you fit the tombstone. Deffo interested in the brackets mate, how much do you want for them? I wouldn't be wanting anything for them, I'll dig them out of the garage at the weekend and let you know. gm wrote: I wouldn't be wanting anything for them, I'll dig them out of the garage at the weekend and let you know. your brackets are on their way. the armrest section is gone completely, all of the wiring re-run, window switches relocated to the tombstone and sticky back neoprene used to cover the tunnel. 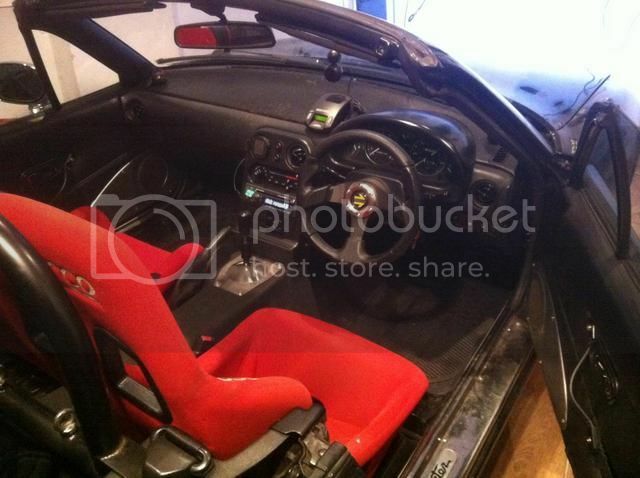 the gear stick is standard but painted black and a fancy shift boot cover off eBay fitted. the bottom of the tombstone was cut flush and a plastic panel covered in the same neoprene fitted over the gaps at the bottom. I ditched all of the carpets, swapped the crash pads for some black ones, rattle canned the lower dash and bought a set of rs-limited doorcards. the door pulls are the type of handles usually fitted to guitar amplifiers, the original chunky handles got in the way of the bucket seats. Wow, that's some transformation mate! Bet those seats are comfy. Really like the wheel, is it the momo race? I had the race years ago, great bit of kit. Genius using the handles from guitar amps! They look trick! they're fantastic when 'pressing on' and up at knockhill on trackdays but when I recently had to use the car to commute, I was glad it was only for a week. lowered suspension, buckets seats, track tyres and the state of Edinburghs roads are not a winning combination. although I did arrive earlier than usual for some reason. Eh? link takes me to a page where there's an app about burning calories? lol I find just waking up in the morning is enough of a calorie burner for me! It was only supposed to be HAL. At least you got a fitness regime chucked in! For what it’s worth I had a similar issue - wanted a new head unit that was visually in keeping with my stock 1995 interior, didn’t want it to stick out much from the tombstone, and wanted to avoid blingy, flashy units. Found out by getting a Blaupunkt unit with Bluetooth that I could have all those things in one - the unit’s faceplate is far more flush than the Puoneer unit it replaced and the recess on the main body of the unit goes a few mm deeper too, meaning it only sits about 4mm out from the tombstone. Also ran the usb connector from the back of the unit under the centre console and into the armrest cubby, to allow for charging etc. Just another possible idea for you to add to your considerations! Last edited by bmv6197 on Mon Dec 03, 2018 8:46 pm, edited 1 time in total.